War-torn Yemen has been largely absent from political discourse even in spite of famine leaving millions of children malnourished, susceptible to disease and starvation. If a ceasefire is not enacted, the U.S. will be complicit in the worst humanitarian crisis, with 13 million Yemenis at risk of starvation. As of September 2018, 5.2 million children in Yemen were at risk of starvation. Civilians are bearing the brunt of a politically fueled conflict; 22.2 million Yemenis rely on humanitarian aid for survival. Supplies are denied to the Huthi rebels with the issuing of blockades of the Saudi Arabia led coalition. The coalition imposes regulations and restrictions on aid in the form of necessities like food, goods, medicine and fuel. The 3 year conflict between Huthi rebels and Yemen’s government supported by Saudi Arabia has created a humanitarian crisis, as aid has not been substantial and the cost of necessities like food and water have become unaffordable for civilians in need. According to the UN, since 2015 food prices have gone up 68 percent. Negotiations have proven futile. The UN Security Council most recently called for a ceasefire and greater aid for Yemen, however the U.S blocked the resolution since it is critical of Saudi Arabia. 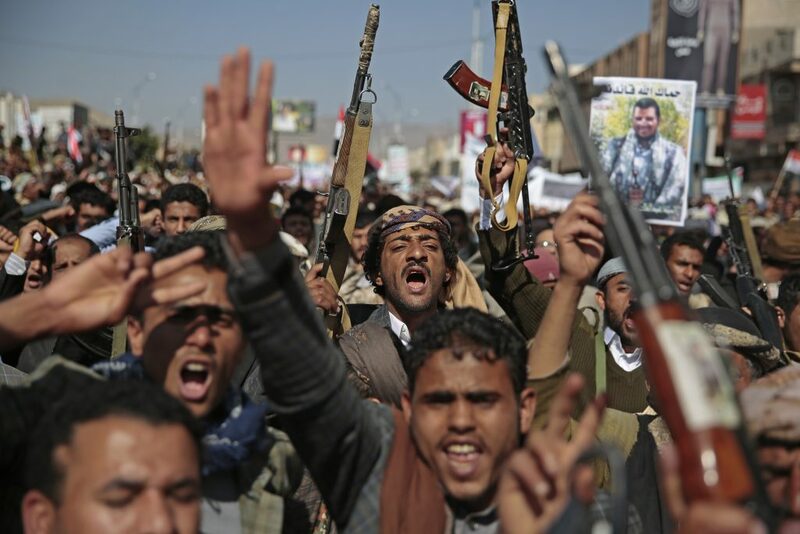 “Saudi Arabia would gladly withdraw from Yemen if the Iranians would agree to leave. They would immediately provide desperately needed humanitarian assistance,” President Donald Trump said in a statement Nov. 20. In this statement, Trump absolves Saudi Arabia from any part in the current humanitarian crisis and brutal warfare. U.S. support for the Saudi led coalition will further exacerbate the conflict. Thousands of civilians have been killed since the start of the war in 2015, and if powerful nations like the U.S. continue to turn a blind eye and voice support for Saudi Arabia, peace talks will prove to be fruitless. Pressure from humanitarian groups and charities to halt support for Saudis in Yemen is based on the fact that this would save lives in Yemen. The situation is only worsening on the ground for civilians and international outrage over the humanitarian crisis is evident. A YouGov survey of 1,168 participants showed that 82 percent believed Congress should vote to halt or decrease arms to Saudi Arabia. This week U.S. senators plan to vote on a bill to end U.S. support for the Saudi led coalition which demonstrates that lawmakers are siding against Trump’s militant agenda. The U.S. has the power to reverse the narrative and demonstrate that the relationship between the U.S. and Saudi Arabia could be compromised if a ceasefire is not enacted.